Eye Magazine | Blog | Who’s responsible? One assumes that the organisers mean for this statement to represent their progressive thinking and timely action in convening graphic design educators ‘to foster an ongoing dialogue and debate about design ethics, sustainability and design education.’ Coincidentally, or perhaps presciently, a small art and design academy in south central Poland already put the topic on the world stage. 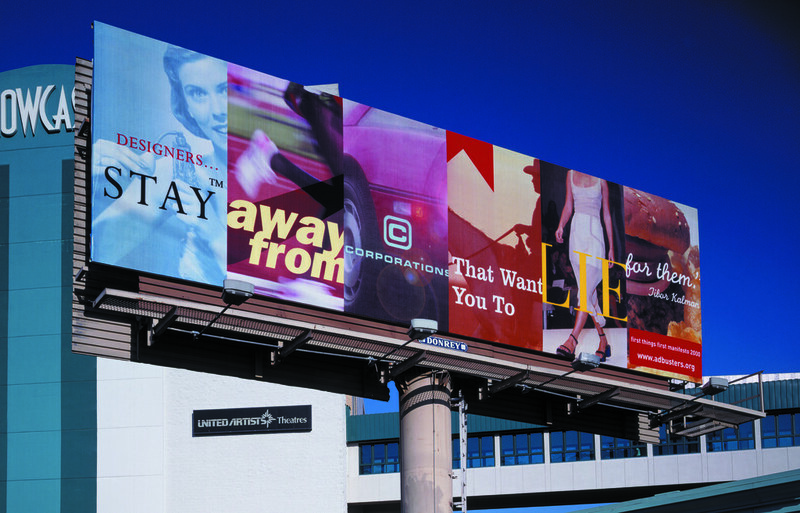 Top: Tibor Kalman’s infamous statement — ‘designers, stay away from corporations that want you to lie for them’, as designed for a billboard by Jonathan Barnbrook near the 1999 AIGA Las Vegas conference. 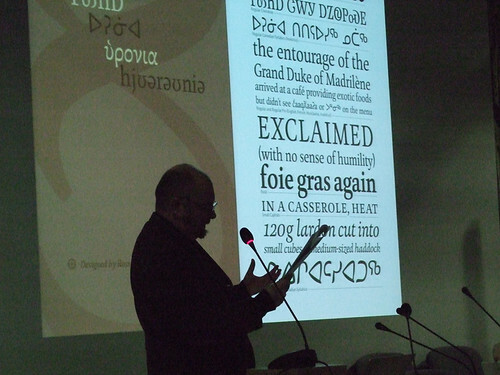 In January 2010 I made a peer-reviewed presentation at the international conference Responsibility in Graphic Design in Katowice, Poland. As with the AIGA Toledo’s Response_ability, it was similarly concerned with ‘responsibility in political, social and religious aspects of design; equality and tolerance; disabilities and dysfunctions; ecology; education; and historical context.’ Besides Polish-born Krzysztof Lenk of the Rhode Island School of Design, I believe I was the only American design educator presenting among a roster that included British typographer Jonathan Barnbrook, Dutch scholar Karel van der Waarde, Noel Douglas, Angela Morelli and other educators and practitioners from Mexico, Canada, Italy, UK, Finland, the Czech Republic, Germany and of course Poland. The conference hosts were gracious and hospitable, pleased that their academy could entice us to visit. 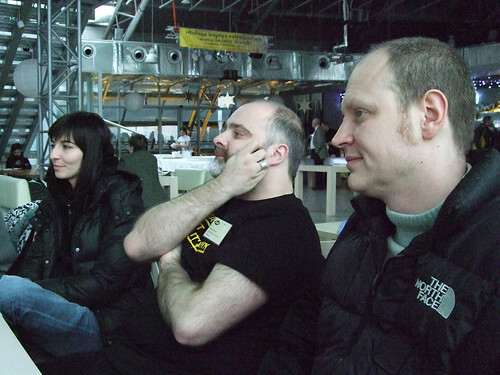 Above: Katowice conference presenters Angela Morelli, Noel Douglas (see ‘Whose space?’ in Eye 66) and Jonathan Barnbrook (see Reputations in Eye 15) pondering a colleague's opinions on the future of graphic design. The context for the conference in Katowice, an industrial city in a steel milling and coal mining region about 40 miles from the Polish jewel of Krakow, and twenty miles from the Auschwitz-Birkenau concentration camp, is multi-faceted. Of the past 70 years – roughly a lifespan – Poland spent 50 under Nazi occupation or Soviet oppression. The much-admired conceptual (and subversive) posters of Roman Cieslewicz and Henryk Tomaszewski were born of this era, as was the iconic Solidarity logo. Some in Poland still view the US as a kind of saviour – in 1945 (sort of), in the 1960s with Bob Dylan et al, and in 1991 with the dissolution of the Warsaw Pact. Poland has European Union and NATO membership, and will have the Euro in 2012 (until then, the zloty trades at three per dollar). A vibrant poster culture is still evident. Yet again, Polish social and political resiliency is being tested – and will no doubt prevail – by the tragic plane crash that killed its president, his wife and 94 others. My topic was ‘Design Authorship and Responsibility: the Personal, the Professional and the Societal’. In my presentation, I maintained that the increased agency of design authorship enables graphic designers to have more responsibility with message content and meaning, but that this responsibility comes with a heightened obligation to the audience or end user. Responsibility, therefore, becomes both a privilege and a burden. I used case studies from the areas of political action, consumer culture and niche publishing to illustrate the social, professional and personal realms of design authorship. Each area was fertile ground for revealing ethical challenges and opportunities. Other presentations approached responsibility from diverse angles. 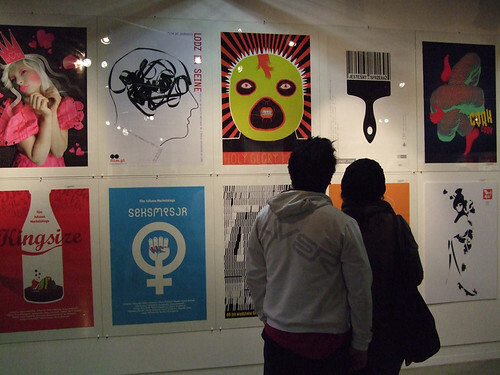 Some examples include: a quantitative study on typography and illustration’s impact on the literacy of dyslexic children; the use of activist graphic design as a tool in achieving a post-capitalist economy; the graphic visualisation of information about global water consumption; and type design as a medium of cultural identity. The AIGA Toledo’s Response_ability conference asks how participants can ‘translate the ideas of the AIGA’s The Living Principles in the classroom and beyond?’. These Principles, ‘the first quadruple bottom-line framework for design’, were ‘born out of the design profession’s need for an aspirational and actionable framework that provides designers and their clients with a common understanding.’ I think it’s appropriate that bottom-line frameworks can help designers and their clients, however the field of graphic design is larger than that. Educators should be the first to address graphic design’s fuzzy disciplinary borders, and not merely treat graphic design as the job that one gets paid to do. Above: Will Hill, senior lecturer in graphic design at Cambridge School of Art, gives his presentation ‘Type Design and the Responsibility to Cultural Identity’. Admirable, yes, but limited to the professional realm. Why do values have to be ‘professional values’? The paradigm of free-market capitalism has been sold to Americans (and much of the world) as the most free, most fair, most just path to prosperity, equality and happiness. I offer any day’s news over the past eighteen months as counterpoint to the notion of professional values across many industries. Remember Tibor Kalman’s infamous quote — ‘designers, stay away from corporations that want you to lie for them’, as designed for a billboard by Jonathan Barnbrook near the 1999 AIGA Las Vegas conference? Many forward-thinking and socially conscious designers paid heed. But who did design the identities, the brochures, the ads, the web sites and the packaging for the past decade’s robber barons? Why are graphic designers discussing responsibility after the crisis? Above: Viewers observe posters designed by students from the Academy of Fine Arts in Katowice in an exhibition accompanying the conference. The conference in Poland has passed, while Toledo’s is upcoming in May – a comparison of content is not possible, and perhaps not desirable. I’m sure that there will be some good presentations by some smart people, my colleagues in the larger world of design education. Alas, a proposal to share my experience in Katowice at the AIGA Toledo’s Response_ability was rejected, so this little essay will have to do. Instead, I challenge the Response_ability conference, in the wider context of its institutional sponsor, the AIGA (and Adobe, its corporate sponsor! ), to consider not only the idea of responsibility on a more international level, but to broaden the definition of responsibility beyond the profession of graphic design. Consideration of design’s social, cultural, economic, political and personal ramifications must be acknowledged if we are to be truly responsible. Steven McCarthy is professor of graphic design at University of Minnesota.